Disclaimer: As a member of the RockNBlog team, I received free race entries for the races. As always, all opinions are my own. Is that blog title a mouthful or what? If you follow me on Instagram or Facebook, you know that I ran all three races this weekend. A little crazy? Sure. A lot of fun? You bet! Although I’m definitely still recovering, as of this morning my legs are feeling much better. My right hip is still pretty tender so I’m going to hold off on running this week (might do a short run this weekend). Soreness aside, I really love Philadelphia and this race. This was my third consecutive year (recaps here and here) doing both the 5K and Half Marathon. The past 2 years I ran this race as part of an 18 mile training run when I was training for the NYC Marathon (2016) and Chicago Marathon (2017). I was happy this year to “only” be running the half marathon on Sunday, but foolishly remembered I was running 9.3 miles the day before for the 5K and 10K! Overall it was a fun weekend and here’s my recap. I worked a half day on Friday and caught a 1:00 p.m. Amtrak train to Philly. It was a very uneventful ride (just how I like it). After checking into the hotel we hit the Expo. Luckily it was only a short walking distance from the hotel. After grabbing our bibs, my mom went to the Solutions desk to upgrade her bib from the 5K to the 10K. It was a super quick process and she was done in less than 5 minutes. Then we went to pick up our race shirts. The shirt for the half marathon was my favorite one by far! I was also happy that I was able to do a t-shirt exchange since mine were too big. While it was smaller than the RnR Chicago expo, there were still a lot of good vendors there. We took a photo right before leaving. The 5K started at 7:00 a.m. so we were up bright and early. This was difficult since an emergency alarm went off in our hotel at 2:30 a.m. and it was hard to get back to sleep after that. Once we arrived at the race start, my mom went to sit down to wait for the start of the 10K. I walked the to tent by the start line to leave my 10K bib. I was thankful that this was an option since I was told at the expo that if I ran with both bibs, the 10K bib would start tracking my time once I crossed the start line. The race started right on time. We started at the Oval in Fairmount Park. We then ran along the Schuylkill River. It was an out and back course, so nothing too exciting, but the scenery was really pretty. I was a little nervous about getting back in time for the start of the 10K at 7:35 a.m., but I tried to push the pace. I went out really fast (for me anyway) at a 9:40 for the first mile. Now I know that’s not a “fast” time for most people, but for me it really is! I remember the days when I could knock out a sub-30 5K with no problem, but now? Not so much lol. Anyways, I was able to keep pushing and finish the 5K totally winded, but otherwise feeling okay. I quickly grabbed my medal and made a beeline back to the race start to switch my bib. Unfortunately I couldn’t leave my 5K medal there, so I had to run the 10K with it (I switched between carrying it in my hand and sports bra, haha). All in all, I had about 4 minutes in-between both races. Then it was time for the 10K. It was at this point that I started to question my life decisions. I decided pretty early on to just coast through the 10K. I stopped at every mile for a walk break, and trust me, I looked forward to those little walk breaks. The 10K route was essentially the same as the 5K route but we just ran along the Schuylkill River a bit longer. It was humid so I was really thankful for all the trees that blocked out the sun. At least we wouldn’t have to deal with the hot blazing sun AND the humidity. At the very end of the race I saw my mom up ahead and I ran faster to catch her. We were able to finish the race hand in hand which we thought would make a great finish line photo. Unfortunately the photographer was too busy taking a million photos of the woman who crossed the finish line ahead of us. I was SO annoyed by that! We collected our medals, water and food and headed over to the Beer Garden. There we ran into some ladies from the Black Girls Run! Philadelphia group. It was really nice to talk to them and discuss the race. After chatting with them, we made our way to the Rocky stairs. Neither my mom nor I have ever run the Rocky stairs. Well we didn’t run them, we just walked, but that still counts! I finally climbed the Rocky stairs! Upon waking up I again questioned my life decisions, lol. My legs ached and I was still so tired, but I tried to think positive as I was getting ready. I met another Rock N Blogger, Rachel, in our hotel lobby and then ordered an Uber. Unfortunately it was taking him a long time to arrive so I had to cancel it and hop in a cab with two other runners. The driver took the highway thinking that would be faster, but the on ramp to get to the park was closed so he literally had to let us out on the highway! It was fine since it wasn’t a far walk from there to the park. We arrived with about 20 minutes to spare but I didn’t need to use the bathroom so I just hung out. Luckily I was able to meet up with Kim in the corral before the race start. I was so happy to see her again! We chatted for about 10 minutes and then we were off! There was a new course this year and I was excited to run it! It was still flat which I really appreciated (and my legs did too). Just like the 5K/10K, we started off in the Oval in Fairmount Park. For the first few miles of the race we ran in downtown Philadelphia (Market and Arch Street) and Center City. This was a change from last year as we were in the city for longer. We then made our way down to Kelly Drive and then Martin Luther King Jr. Drive, both of which run along the Schuylkill River. The race ended right by the Philadelphia Museum of Art by the Rocky stairs. My right hip started hurting me about 1 mile into the race, but I made a deal with myself to run at least half of the race and then do run/walk intervals, which is exactly what I did. I ran/jogged/hobbled the first 7 miles and then took walk breaks every mile after that. It helped to take the pressure off my hip during the walk breaks, but my quads were still super sore so I knew I was running slower than usual. That was okay with my because I just wanted to finish! Although we were blessed with shade from the trees for a majority of the race, we weren’t so lucky for the last three miles. There was still some shade, but not much. The last mile of the race was in direct sunlight. At this point I was so hot and it was so humid that I was a wet sweaty mess. That last mile took FOREVER but I kept shuffling along and let out a sign of relief when I saw the mile marker 13 sign. Finally I saw the finish line! Post Race Snacks – The post race food was on point. They had bottles of water, gatorade (for the half marathon), soft pretzels, bananas, fruit snacks (for the half marathon), kettle cooked potato chips and pretzels with sabra hummus. Medals – This race series is known for their medals and the Philadelphia medals didn’t disappoint. My favorite was the half marathon medal. But I’ll be honest, at first I didn’t know that was on the 5K medal but then I figured out that it was a pretzel. 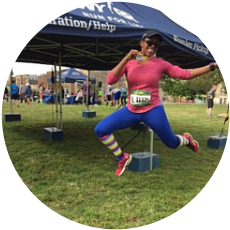 Half Marathon Course – I really loved the improvements to the course this year. It was nice to spend a little more time running in the city, especially through downtown. Water/Gatorade – There were plenty of Gatorade and water stations along the course. they also offered SIS gels a few times on the course as well. Post Race Snacks – While the snacks were great, there were no bags to hold everything. I found a small box so that I could use it to carry our stuff back to the hotel, but it was a little annoying. Bands – While I did see bands out on the course, the music wasn’t that great. I was expecting to hear upbeat tempo songs but was often greeted with slow songs. Hard to feel that rock n roll vibe with that type of music. Communication – I heard from several runners that they found the communication to be difficult, especially when it came to bib pickup. 5K/10K Course – I wish that the shorter distance races also included running in some parts of downtown. The route can be a little boring. Half Marathon Start Time – If the 5K started at 7:00 a.m., then the half marathon should have as well. Sure, it’ only a 30 minute difference, but those 30 minutes would have made a difference for the last 3 miles running in the sun. Race Shirts – It seems like the sizing changes from race to race. I would definitely run this race again. Philadelphia is such a fun city with lots to explore. They also have amazing restaurants as well! There are a few more Rock ‘n’ Roll races this year. If you’re planning on running one, why not save some money? You can use code RNRRNB2018 for $15 off the full and half marathon at US & Montreal races (excluding Vegas). Thinking about running Las Vegas in November? Use code RNBVEGAS10 for $10 off the Half Marathon or Marathon and RNBVEGAS5 for $5 off 5K/10K! I love it when a race has good post race snacks! Good job for finishing even with a hurt hip! I hope it feels better soon. Me too! This race had some really great food. The pretzels and hummus were amazing, especially after the half marathon because I just wanted salt! Right?! I was like what is this – I wanna rock out! You must have been in the same hotel as my friend, Zoe. She was woken up by that alarm, too – worst! Also totally agree the half should start at 7. Those last few miles were brutal. I’m still so sorry we didn’t get to meet up! Ugh – it was the WORST! And it went off for a good 10 minutes and it was so loud. After that I couldn’t really get back to sleep. So sorry we didn’t get to meet up but I’m really considering San Antonio so I’ll probably see you there! Doing all three races was quite the accomplishment! I only did the half for this one – it was so gross and humid, although the day before was cool and perfect race weather. Go figure. Congratulations on all those miles! And I’m glad you were able to listen to your body when your hip was bothering you. It’s sometimes hard to hold back, but you’ll be glad in the long run. For some reason it’s been humid every year I’ve run in Philly. It’s a shame because the course is pretty flat so it would be a great course to attempt a PR. Thanks Kim! I had my own music too but sometimes the band music, or DJ, drowned out my tunes lol. Wow! You are a trooper! I don’t know how you kept going for 12.1 more miles after that hip pain in mile 1. Way to go! Thanks Lex. Luckily I had a really good playlist so I just tried to focus on my music for those miles, lol. First of all, CONGRATS! You’re amazing and that had to be quite challenging! I also don’t envy running a half with that kind of direct sunlight, I would have totally melted 😛 Great job! Thanks Annmarie! Thank goodness the full on direct sunlight was only for the last mile. There’s no way I could have done a whole half marathon in those weather conditions! Congrats on finishing all 3 races! How weird that the half started later than the 5K. Awesome job running all three races Kim! I chuckled when you said you questioned your life choices. So odd about the choice of music along the course. It’s good to hear they included more running in the downtown area – I’m hoping to get back to this race next year. Thanks Michelle! I often do wonder why I run all these races, lol. Some of the music choices were just a little odd. Love your Half leggings, and of course Kim’s headband. Congrats both! Wow so many things! 4 minutes of turnaround time between the 5k and 10k sounds brutal – I can’t imagine pushing those paces back to back. How cool you saw Kim in the corrals too! You totally impress me with this running weekend, way to go and it’s definitely smart to take time off to let the hip calm down! Yeah I wish I had more turnaround time, but in a way it was probably good because my legs didn’t have time to get stiff!